Scallop Potatoes and Ham | Who Are You Calling Crafty? Growing up the one thing I could hardly wait for was the day after Christmas, when my mom made Scallop Potatoes and Ham. This year I decided to make Scallop Potatoes and Ham for several reasons. One, the ham Jeff bought was bigger than his head and two, it snowed Sunday. 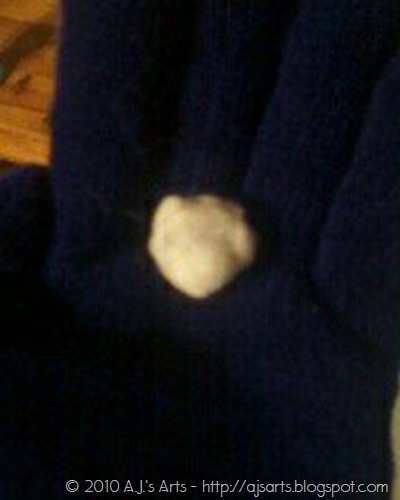 That is my snowball from Sunday – it was the size of a penny. Layer sliced potatoes, ham and onions in a Dutch Oven Pan (or similar pan). Once three potatoes have been layered add one of the Cream of mushroom soup cans, spread with spoon. Finish layering the potatoes, onions and ham. Add the second can to the top, fill the can with buttermilk and dump around the pan. Place in oven and bake for one hour and serve.